Please add $19.50 for shipping, handling, and insurance. Immigrants in a New Land depicts immigrants adjusting to a new life in America. The street is busy with flower vendors and horse carriages. Immigrants in a New Land copyright© 1991 by G. Harvey is prohibited from being copied. 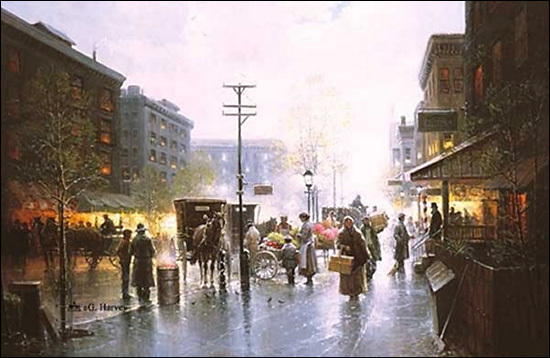 G. Harvey art, cityscape, cityscapes, flower cart, flower vendor, horse carriage, New York, nostalgia, nostalgic, artwork, art work, canvases, images, paintings, pictures, and prints of Immigrants in a New Land by artist G. Harvey for sale. 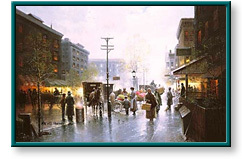 Immigrants in a New Land painting by artist G. Harvey can be purchased in art print or canvas form at special sale prices at Christ-Centered Art.